St. Ia was an Irish princess, the sister of She was the sister of SS. Euny, Erc and Anta. She is said to have been converted to Chrisianity at an early age by St. Patrick the Old. Later, she resolved to join SS. Fingar and Piala's party who were sailing for Cerniw (Cornwall). However, they left Ireland without her and Ia reached the beach only to see the disappearing over the horizon. Sobbing bitterly, she sat down on the sand to pray. A tiny leaf on the water caught her eye and she touched it with her staff in order to make it sink. Instead, however, the leaf grew and grew. Soon it was so large and thick, that Ia was able to clime aboard and use it as a raft. She thus floated across the Irish Sea and arrived at Penwith in Cerniw even before those who had left her on the beach. Ia became a disciple of St. Berwyn (alias Barric) and was soon joined by St. Elwyn and 777 companions. She founded the church of Pen Dinas (Dinas Ia, part of St. Ives) and her holy well, the Venton Eia (or Ffynnon Ia) was nearby at Porthmeor. She also set up a chapel at Troon in Camborne parish, near another well, the Fenton Ear (or Ffynnon Ia). She may have also made sojourns to Brittany, where Plouyé near Carhaix is named after her. Ia's presence in Penwith was not, however, universally popular and she was persecuted by the local ruler, King Tewdar. He eventually found her so troublesome that he had the poor girl murdered. She was buried at Porth Ia (St. Ives). Her feast was on 3rd February. 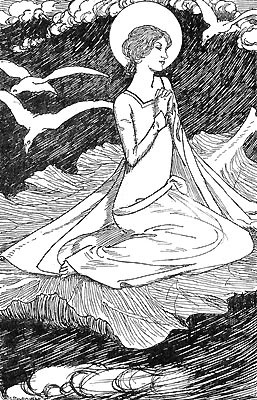 In art, St. Ia is represented clothed in white wool, as an Irish Abbess, with a white veil, sometimes crowned, and holding a leaf.